Jason Plotkin grew up in Simsbury, Connecticut, a small town north of Hartford. Beginning his farming career at 12 years old, Jason began his tenure at an old family owned farm, Rosedale Farms. Here, working in the hot humid summers of New England, picking corn, beans and peas, Jason learned the value of hard work and the seed of his passion for farming began to sprout. From 12 years of summer employment he gained experience in everything from viticulture to underground irrigation techniques and even aquaponics and aeroponics. After graduating from the University of Vermont in 2010 with a BS in Wildlife Biology, Jason was hired at Flying Pigs Farm, located in Sushan, NY, and for the first time, learned skills in animal care. That following Spring his passion for farming landed him as the Assistant Manager at Sol Flower Farm, located in Ancramdale, NY. 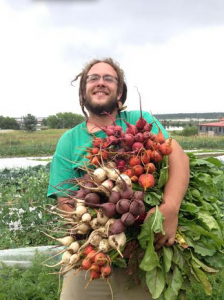 He submerged himself in agricultural literature and the sustainable farming community and quickly came to realize that Colorado has one of the fastest growing organic and sustainable food markets. Landing in Denver in late 2011, he started a small farm in Golden, CO and has now expanded into the operation they have today. Jason’s mission is to use holistic, sustainable farming practices to produce the best products possible and to create access to these products for everyone regardless of income or class. Partnering with the Weinberg Food Pantry every week Golden Acre Farm donates a portion of their harvest to share the bounty of the land with people in greater need. Golden Acre Farm opens their land to everyone who wants to learn, and by doing this; hopes to instill the sense of appreciation, gratitude, and hard work that comes with growing sustainably raised food.